By ROYAL QUICK DASH SI 101 (1989). Champion, $1,046,980. Sire of 769 ROM, 72 stakes winners, $16,869,066, including AB WHAT A RUNNER SI 109 (champion at 2 & 3, $1,342,389, All American Fut. [G1]), QUICK MOON SIGN SI 103 ($419,781 [G1]), SIXES ROYAL SI 101 ($384,977 [G1]). Sire of the dams ofFOOSESI 101 ($705,505, Ed Burke Million Fut. [G1]), HICLASS LA JOLLA SI 104 ($349,118 [RG1]), CHICKS LIKEUSSI 97 ($264,964 [G1]). Nurse Dorothy SI 88 (Royal Quick Dash). Stakes placed winner, below. ETTAGOCHICKIE SI 96, by Ettabo. Champion 2-Year-Old Filly, 8 wins in 14 starts, $534,465, Dash for Cash Futurity, Kindergarten Futurity. ALL ABOUT CASH SI 122 (Dash For Cash). Champion in Mexico. Chicks Desire SI 101. Dam of MISS SONORA FEATURE SI 105. Redigo Chickie (Dash For Cash). Dam of METER ME READY SI 104 ($160,881 [G2]), REDIGO RONA SI 95 ($85,514 [G2]), Impromptu Affair SI 97 ($70,623); granddam of Runaway Romance SI 100 ($77,174 [G1]), Red Temptress SI 97 ($43,343 [G1]). 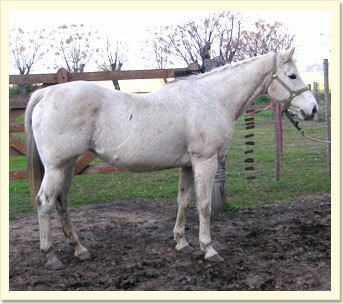 Champagne Chickie SI 83 (Raise Your Glass TB). 2 wins to 3. Dam of DR MARK ET AL SI 102 ($37,759 [G3]), THE CONTRACT SI 102 ($23,518), ANOTHER FIRST DOWN SI 102; granddam of GONNA RO SHAM BO SI 95 (4 wins in 6 starts at 2, $118,336 [R] [G2]). RACE RECORD: At 2, one win, twice 2nd, once 3rd; at 3, one win, once 2nd, once 3rd (Fair Meadows Belles S.). TOTALS: 2 wins, 3 times 2nd, twice 3rd. EARNED $13,199. BRIDLEWOOD TIN MAN SI 90 (g. by Bridlewood). 4 wins to 4, 2008, $27,517, Grand Prairie Classic S., 2nd TQHA Distance Derby, finalist in the Governor’s Cup Marathon [G3]. Tres Ruby SI 95 (c. by Tres Seis). 4 wins at 3, 2008, $9,692 in Mexico. 2002 Dorothy Dorothy SI 104, f. by Heza Fast Man. 3 wins, 2 to 5, $47,100, finalist in the AQHA Central Distaff Challenge S. [G3]. 2003 Jess Braveheart SI 100, g. by Feature Mr Jess. 6 wins, 3 to 5, 2008, $80,270, finalist in the Northlands Futurity [G3]. 2005 Dr D SI 92, g. by Heza Fast Man. 3 wins to 3, 2008, $63,744, 2nd Northlands Futurity [G3]. 2006 Mitey Oak, g. by Oak Tree Special. Unplaced in 2 starts. 2007 Monterosso, f. by Looking For Chicks. Last BRED April 3, 2008, and believed in foal to SCRUTINIZER.